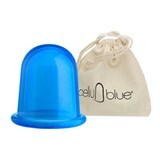 CelluBlue is a registered trademark in Paris, which revolutionized the market with the launch of an innovative suction cup indicated for the treatment of cellulite! This cup exclusively made of medical silicone, acts through reproduction of vacuum massage, a non-invasive procedure, avoiding surgical procedures! The results are amazing and visible at the end of 21 days of use! CelluBlue is the innovative treatment that will help all women eliminate cellulite!